When Eric B. Heinbockel graduated from Columbia University, he launched a job search during one of the worst economic recessions in recent history. After a full year of job searching, he still had not landed a job. With little to lose since he was unemployed, Mr. Heinbockel co-launched a specialty chocolate company. I interviewed Mr. Heinbockel about his venture and wrote about his success. Eric, please share with us your job search experience before you decided to launch a company. For a full year after I graduated from Columbia University, I looked for a full-time job. During this time I worked as an unpaid intern at a structured finance firm in New York. I was offered three jobs during the year I spent looking but all were commission based with little or no base salary. I was interviewing for these jobs in the fall of 2008 and I interviewed on the days that Bear Stearns and Lehman Brothers went under. After you couldn’t find a full-time job, what did you do? I helped to co-found Chocomize, the first mass customization/co-creation chocolate company in the United States. Customers create their own custom chocolate bars by selecting their base Belgian chocolate (dark, milk, or white) and then adding up to five ingredients from a selection of over 100. Ingredients range from fruits and nuts to 23 karat gold flakes and even beef jerky. That sounds delicious! How did you survive financially while you started your business? We survived financially during the earliest stages of our startup by keeping our spending and costs down and figuring out creative inexpensive ways of spreading the word about our new and unique company. This meant taking full advantage of social media and pitching our story to journalists at as many and varied publications as possible. As a result we became profitable after four months and we have been featured in Oprah Magazine, CNN, Costco Connection Magazine, and many others. While we are not getting rich yet (we are re-investing most of our profits), getting a paycheck at all is an improvement from my previous predicament. What skills and previous experience were you able to bring to your business that are helping you to succeed? The three skills that I think have proven to be very useful in running our business are critical / analytical thinking skills, writing skills, and sales skills. The first two I think were mostly developed during college. I developed sales skills through several jobs and internships. The best part about running my own business is that there are constantly new challenges that come from a wide variety of sources. Every day there is a new issue or opportunity that needs to be addressed, which makes things more exciting. I am not solving the same old problem with a formula; therefore, the job is never boring. The most challenging thing about running my own business is also what makes it interesting. The variety of issues that come up often puts us outside our comfort zone. In order to become successful and hold our own in negotiations we have had to learn about other industries in our supply chain. An example is learning the language and process of cardboard packaging manufacturing. It can be difficult to constantly learn enough about other industries to make sure we get exactly what we want at a fair price. I think I have had to learn more organization and time management skills than I previously had. We always have a variety of very different tasks and issues to deal with simultaneously. This demands organization in order to get everything done properly and on time. The career advice I would offer for those considering their own startup as an alternative to a traditional career is to recognize that there is a great deal of risk associated with starting your own company, and those risks are increased as the economy is in recession. In my case, however, the risk wasn’t as great because I had no job to give up. The other thing is that once you begin your own business, it is a constant part of your life. While you may be able to take off certain times and work on your own schedule, your work will always be there and often needs to be taken care of during times that in your previous job you could leave the work at the office. In most cases if you don’t do it, no one else will, either, when you are first starting out. This means in most cases you will be working more hours than you did at your previous job. Don’t start a business if you have a romantic fantasy that being your own boss means you can come and go as you please. 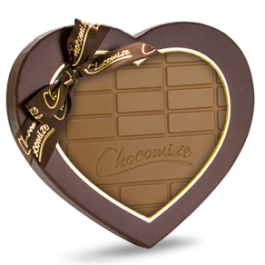 Click here to buy Chocomize’s custom chocolate. If you enjoyed this success story, please share it!